We are one of the eminent Suppliers of Glymin Tablets. They act as herbal insulin sensitizer and also serve metabolic derangements associated with insulin resistance. These tablets are indicated in PCOS as they are effective in reducing hyperglycemia; associated symptoms and complications. Glymin Tablets help in maintaining normal blood glucose level and preventing acute manifestation & long term micro and macro vascular complications in NIDDM patients. One can obtain Glymin Tablets from us at market-leading prices. Each tablet is prepared out of Salacia oblonga (Peetika) 300mg - Reduces intestinal glucose absorption & management of long term complication. Syzygium cumini (Jambu) 200mg - Increases insulin secretion & prevents formation of new glucose in the liver. Pterocarpus marsupium (Asana) 200mg - Increases Insulin secretion and improves glucose utilisation. Gymnema sylvestre (Meshasringi) 100mg - Reduces blood glucose and food craving. Emblica officinalis (Amla) 100mg - Prevents optic neuropathy. 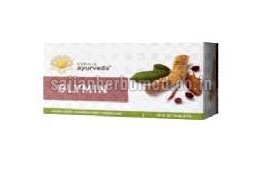 Curcuma longa (Haridra) 100mg - Reduces oxidative stress, food craving. 2 tablets thrice daily before food as a monotherapy.